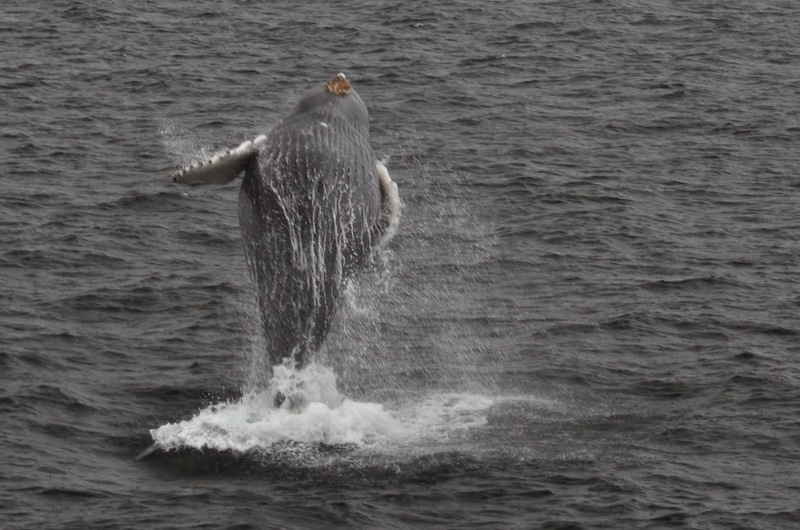 We had an another day of amazing whale watching out on Stellwagen Bank! We saw four different mother calf pairs including Wizard, Milkweed, Midnight and Baja and each of their calves! As far as we know, this is the first time Baja has been seen this season. We are very excited to see that we caught her just in time to learn of her 2014 calf before they split. Both Milkweed and Baja’s calves were exhibiting signs of grown up feeding! Milkweed’s calf was blowing bubbles and surfacing between them while Baja’s calf surfaced a couple times with a big open mouth! Midnight’s calf was the one who really stole the show. 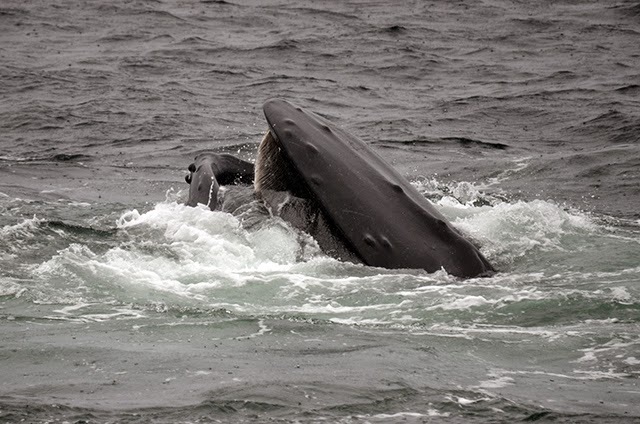 This energetic calf breached and flipper-slapped throughout the ENTIRE whale watch! 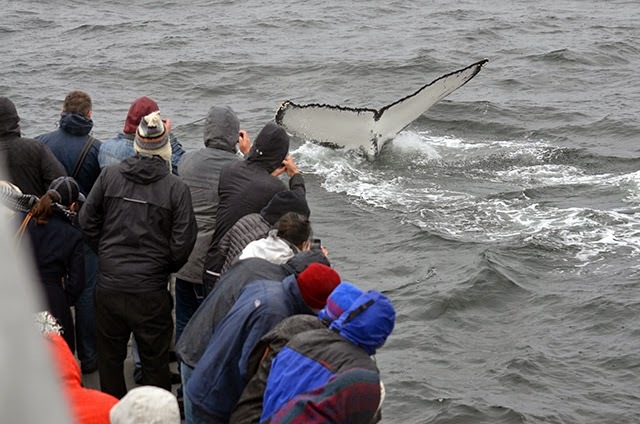 Everyone on board was pretty drenched by the end of the whale watch, but I’m sure everyone on board would agree that it was well worth it! 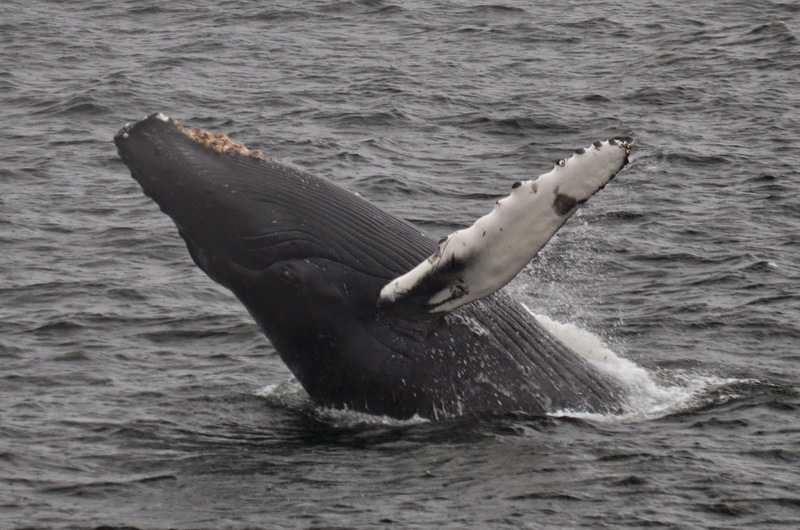 Overall, there were probably about 15 different humpbacks in the area, many of which we were unable to identify in the rain. We did, however, recognize one duo as Salt and Colt who have been together for a few days now. We can’t wait to get back on the water to see what tomorrow has to offer! 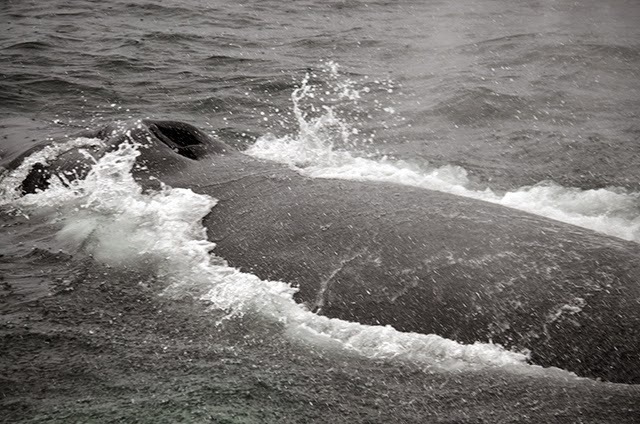 This afternoon we travelled out to the southwest corner of Stellwagen Bank. The rain and fog was worrisome, but it certainly didn’t stop us from having an outstanding trip. Once we reached the corner, we spotted a minke whale right away pretty close to our boat. There were other blows from larger whales in the distance though, so we continued forward. There were a few other whale watch boats in the area who were watching humpbacks as well, but we decided to continue on to find whales of our own. Suddenly, we spotted a breaching humpback about a mile in the distance! 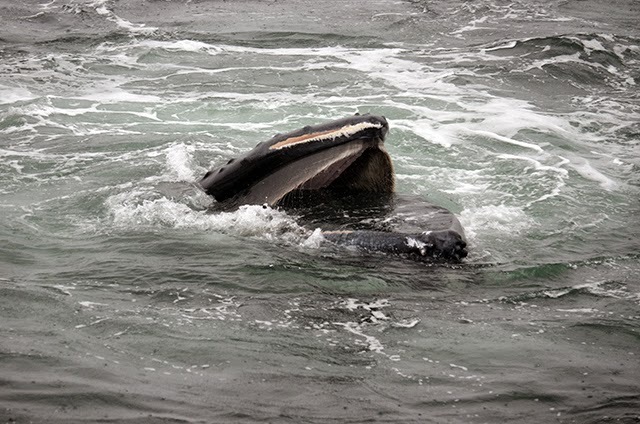 We headed in that direction as the whale continued to breach two more times. Once things started to settle down we noticed more and more whales in the area! We spent the beginning of our trip watching Wizard and her 2014 calf. Wizard was actively feeding and made huge bubble-nets that both her and her calf surfaced in. 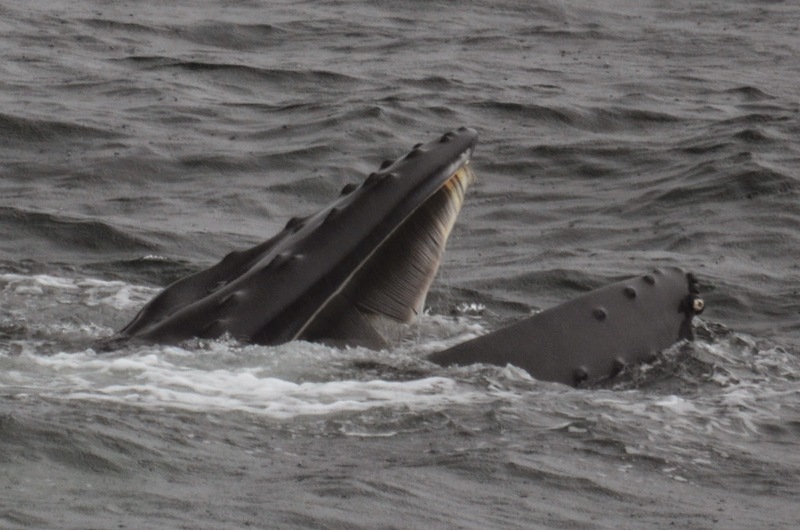 At one point, they surfaced right next to our starboard pulpit and everyone got a super close look. Check out the photo of Wizard’s open mouth, with scarring on the right upper lip along with the photo of Wizard’s fluke right next to the boat! Later on, we watched Baja and her 2014 calf! This pair is a new sighting for us this season! It’s amazing that even at the end of the season, we continue to see new whales! Baja’s calf was practicing feeding right along-side her mother. 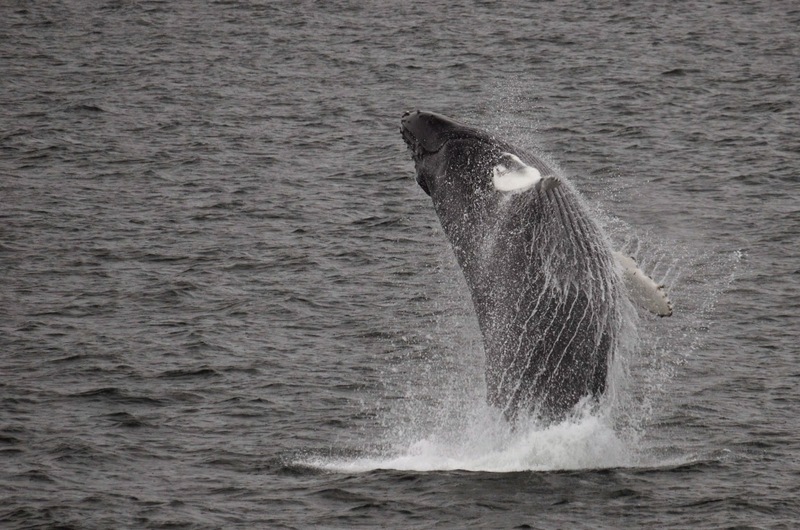 At the end of the trip, we were treated to a HUGE breach from one of the adults in the area. It was a great finale to a full day out on the water. 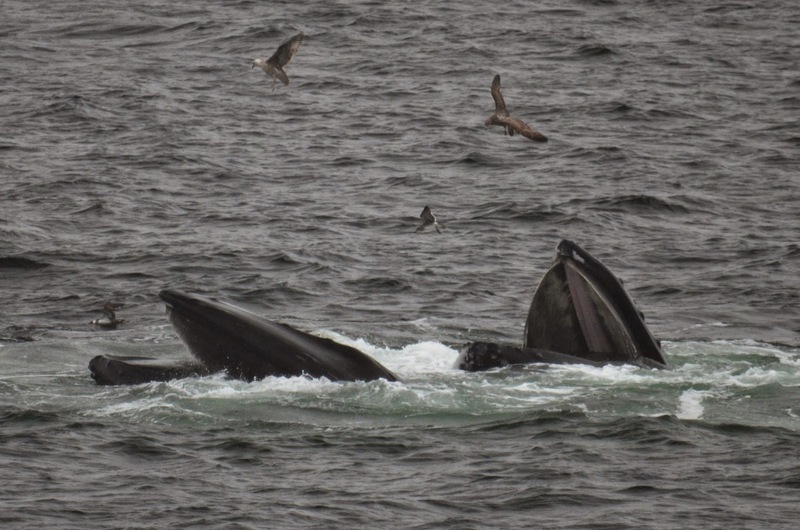 Overall there were 8-10 humpbacks in the area and a few more minkes as well. Also, we saw many shearwaters and some Northern Gannets. Glad to see the skies are clearing up for tomorrow!